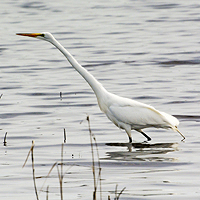 Herons and Egrets: These generally larger birds are fish specialists. They have long, straight spear-like beaks and strong muscles in their necks that help them strike into the water to quickly nab a passing fish. You will often see herons and egrets stand very still near the shore, intently watching the water, until with a lightning strike, the bird has a meal. Herons and egrets have long legs and necks and when they fly they keep their necks tucked in. Once you determine you are looking at an egret or heron, to narrow it down an easy first clue is color. If it’s white, it’s almost always an egret. The more common egrets in the United States are Great Egrets, which are large, and Snowy Egrets, which are smaller and have yellow feet that look like “golden slippers”. Cattle Egrets are smaller still but are found in grassy areas and not at the beach. If you are looking at a big, bluish-gray heron, that’s a Great Blue Heron. There is one exception to the white color rule, in that Great Blue Herons have a white morph. But your most likely candidate if the bird is white will be an egret. Cranes: Cranes are waders too, but they are omnivores, and will eat anything they can find including grains, berries, insects, crayfish and sometimes fish if they can catch them. The only two species of cranes native to North America are Sandhill and Whooping Cranes. Like herons, cranes have long legs and necks, but when flying, they extend their necks out straight. Also unlike herons and egrets, cranes cannot perch in trees. Cranes all have unusual calls, like this Sandhill Crane, which is also the most abundant crane species in the world. In contrast, Whooping Cranes are the rarest crane in the world. Adult Whooping Cranes are white, while Sandhill Cranes are brownish red.